Pictures of the 30's dresses! I also have a 20's outfit from today to show you all tomorrow. Last night I was looking at Fashion Rocks and having a Kurt Cobain Rodarte hernia, now I'm looking at golden oldies again? 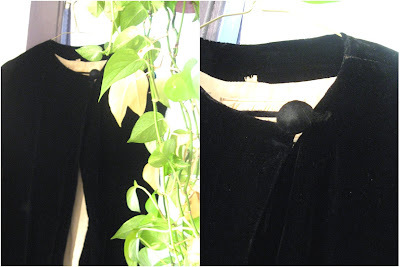 This one below is a very long, droopy velvet cloak. It hangs beautifully and the button is swell (I'm starting to talk old, too). I think I'll shorten it. These are the sleeves of two different dresses. 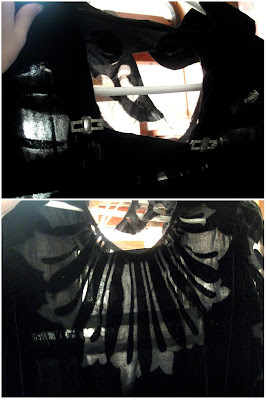 One has sheer black slit-ish stripes, and the sleeves are pretty poofy. They remind me of princess sleeves, always a plus for days when I feel high-maintenance. The second one is the sheer cutout of one of those pillar-looking Roman (Greek?) things. We learned about them last year but I forget what they're called (proof that what we learn in school is forgotten in two months time). 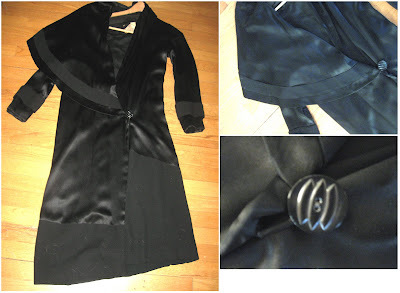 This pretty little number below is a coat whose fabric is uneven at the bottom (purposefully), and whose half collar drapes around and is sealed with a cute little button. Silk, I believe. The lining is gorgeous, I should've gotten a picture of that as well. I'm not sure which dress this label is from, but it looks so nice. Macy's can add as much red star stuff as they want to State Street, but Marshall Fields, you will be in my Chicagoan heart forever. It was hard getting good pictures of the dresses, but you'll definitely be seeing them again. What do you suggest I do? 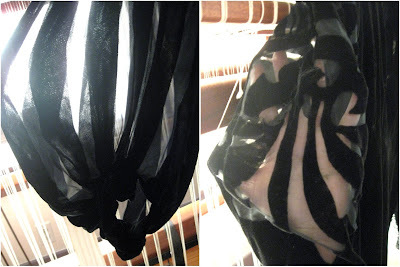 Some are tearing a bit, but I'll try my best to cut and sew and hem and shorten and fix and whatnot. Though I cannot sew for my life and haven't a fraction of enough patience to learn how. I'm going to vintage dress ruiners hell for sure.